Graham Landscape and Design LLC designs, installs, and maintains residential and commercial landscapes in Pleasant Hill Oregon. Pictured to the right is a complete landscape and outdoor living area in Pleasant Hill Oregon designed and installed by Graham Landscape and Design LLC. The Problem: These homeowners entertain friends, family, and neighbors on a regular basis year-round and needed an outdoor living space and outdoor kitchen to better enjoy the beautiful climate of Eugene, Oregon with their friends and family. Their wood deck and covering were not professionally built and had become a hazard to walk on and walk underneath. 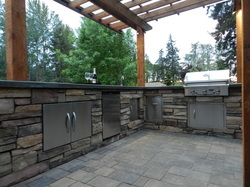 Our customers wanted to have their outdoor kitchen under a covering so they could entertain and cook outside year-round and not be bothered by the rain we sometimes get in Oregon. 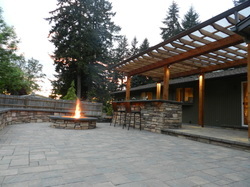 They decided to hire Graham Landscape and Design LLC, a professional landscape design build company, to draw up plans and install a beautiful outdoor kitchen and outdoor living area in Pleasant Hill, Oregon. The Solution: Graham Landscape and Design LLC designed and installed an outdoor kitchen under a Suntuff covering so that these homeowners could enjoy their space all the time. We worked with these homeowners down to the minutest detail of what size barbeque, what type of sink fixture, and even the handles for the storage cupboards. Graham Landscape and Design LLC suggested upgrades such as the LED low-voltage lighting for the roof and wall and step lights to make sure the winter darkness was kept at bay while enjoying the outdoor kitchen and outdoor living area. Night lighting also helps with security and reducing the difficulty of navigating steps at night. 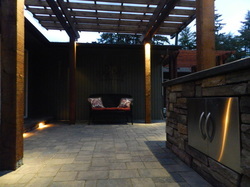 We used a cultured stone for the facade of the outdoor kitchen, fire pit, and seat wall. Using the same material in each of these elements really helps with continuity of the design. Graham Landscape and Design LLC then poured a concrete cap for each of these features. The seat wall and fire pit cap is perfect for resting the bones after a long day at work. The dining area counter-top was finished with a special sealer to ensure the longevity of this heavily used surface. These homeowners in Pleasant Hill Oregon love their large rough-sawn cedar posts for their outdoor structure. This adds just the right amount of natural cedar element to the look and feel of the outdoor kitchen and outdoor living space. 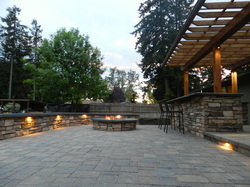 The outdoor firepit was created extra deep for this project so the warmth from the fire could be felt throughout the paver patio. We designed a wood storage area into the structure near the firepit for easy access to re-stoke the fire. 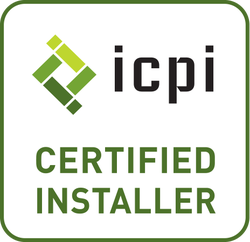 Being ICPI certified, Graham Landscape and Design LLC has the resources, experience, and knowledge to install paver patios like this one pictured to the right correctly, the first time, and to or above industry standards. All of our Belgard paver patios carry a lifetime warranty from the manufacture because they are installed by a Belgard Authorized Contractor. Graham Landscape and Design LLC managed this entire project from initial consultation, to design, and installation of all features of this outdoor kitchen and outdoor living area. This way the homeowners did not have to play general contractor themselves managing numerous different companies to complete this project. The end result of the landscape design created by Graham Landscape and Design LLC is the finished product that these homeowners in Pleasant Hill Oregon love to come home to. It is great for them to have a tangible reward for their hard work and place to let go of cares and concerns, enjoying friends and family and the outdoors on a regular basis.